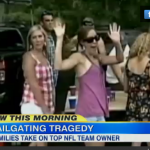 Dan appeared on Good Morning America today to discuss the case of the lawsuit against the New England Patriots regarding the death of twenty year old Debra Davis, who was killed in a drunken driving accident after tailgating at Gillette Stadium in 2008 before a country music festival. The lawsuit claimed that Robert Kraft, the owner of the Patriots and Gillette Stadium, failed to properly police tailgaters for underage drinking. On Monday, moments before the trial was set to begin, Kraft and the the Davis Family reached a settlement. Explains Dan Abrams, “They didn’t have tickets to the festival… Look, this was a tough case, and I think that the reason that they ended up settling was because a judge let this go to trial at all. There’s no question the Kraft family was hoping the judge was going to throw it out… The minute that judge rules ‘I’m going to let it go to trial’, you’re risking sympathy on the part of the jurors, that the jurors are just going to feel bad and feel horrible about the tragedy that occurred and say somebody ought to pay for this, that’s the concern, that’s the reason for a settlement but I’ll tell you, this was not a strong legal case” For more, watch the segment here.